The small group of American tourists followed their guide into the main square of Kazimierz, the historic Jewish district in Krakow, Poland’s second-largest city. “Before 1939, Poland was the most multicultural, multireligious country in Europe,” Tomasz Cebulski told the group as they stood outside one of the seven pre-war synagogues still standing in the neighborhood. Jews, he continued, were prominent citizens in Poland. They were urban and urbane — one-third of Warsaw’s pre–World War II population was Jewish, as was one-quarter of Krakow’s. Half the physicians in Poland were Jewish, and two Jewish political parties sat in the Polish Parliament in the 1930s. Certainly there were shtetls, and Hassidim — plenty of both. But the legacy of Polish Jewry is much richer and more variegated than the stereotype would have it, he said. “The image of an old guy chasing a chicken around his yard, that’s totally not true,” Cebulski said. That world is gone today. More than 90 percent of Polish Jewry — some 3 million souls — died during the Holocaust, most of them murdered between September and December 1942 in Nazi death camps. Four months was all it took to wipe out an entire civilization. Today, according to best estimates, there are between 5,000 and 20,000 Jews in Poland, a small remnant of the 250,000 survivors who returned after the war and who, for the most part, immigrated to Israel and North America. So how is it that Poland celebrates its Jewish heritage with such enthusiasm, from the annual Jewish Culture Festival in Krakow — Europe’s largest, now entering its 25th year — to Warsaw’s $100 million Museum of the History of Polish Jews, which opened its core exhibition just weeks ago? How is it that Jewish studies are offered at most major and some minor universities, and Jewish institutions from synagogues to JCCs are opening in Warsaw, Krakow and beyond? Most of the time, it is not Jews who are filling those classrooms, attending those festivals or showing tourists around Jewish sites. Rather, it is young non-Jewish Poles fascinated with their country’s vanished Jewish world, curious to find out more, and determined to preserve its past, guard its present and shepherd it into the future. “Jewish space couldn’t exist in Poland without non-Jewish Poles,” says Helise Lieberman, an American who has spent more than 20 years in Warsaw and is the director of the Taube Center for the Renewal of Jewish Life in Poland Foundation. There are other countries, notably Germany, where non-Jews play a role in preserving Jewish culture. But nowhere else are they so integral to the process, for in few other places is the Jewish absence as total, while the Jewish history is as rich and as entwined with that of the nation as a whole. Jews have been part of Polish society since the 10th century, and their presence has contributed significantly to the country’s economic and cultural development. A minority, they were nonetheless an ever-present and public part of society. “On the Polish side, there’s a tremendous desire to embrace their Jewish history as Polish history,” says historian Barbara Kirshenblatt-Gimblett, who headed the team that developed the core exhibition at the Museum of the History of Polish Jews, which opened in Warsaw to great fanfare on Oct. 28 (see http://www.bit.ly/jweekly-museum-poland). Jewish studies is an area that attracts many non-Jewish Poles. In 2003, Magdalena Matuszewska, who had just received her master’s in Hebrew studies from the University of Warsaw, went to Lublin to help organize that city’s first Jewish studies course. The first day of class she saw a large crowd milling about in the hallway. “I thought, ‘Is the course canceled?’ But no, there were so many people they simply couldn’t fit in the room,” she recalls. Edyta Gawron, a professor of Jewish studies at Jagiellonian University in Krakow, says that “95 percent” of her students “have no Jewish background” at all. Some are looking for answers to the unspoken secrets in their town. That’s true of Gosia Fus, 31, who works in the education department of Krakow’s 10-year-old Galicia Jewish Museum and, like Cebulski, gives guided tours of Jewish sites. Fus grew up in Nowy Targ, a former shtetl near the Slovakian border. She remembers walking through the market as a child with her grandmother, and the older woman would point out the shops that used to be owned by Jews. Other Polish non-Jews dedicate their free time to helping what they see as a beleaguered minority. Magda Arabas, 28, coordinates some 40 volunteers at Krakow’s Jewish Community Center, a thriving 6-year-old institution with more than 500 dues-paying members. While most of those members are Jewish, the volunteers — including Arabas — are not. “There’s a really big group of people who want to help,” she explains. 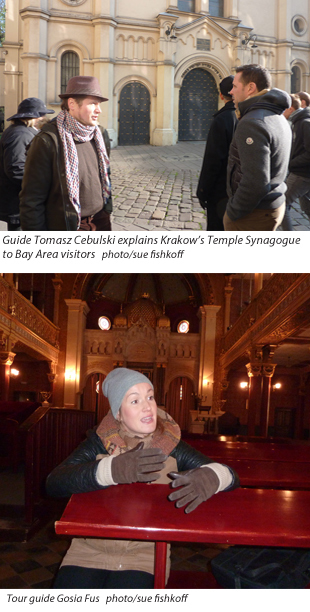 “Some have personal stories, some want to learn about Jewish culture because they live in Krakow [where it’s a big part of the city’s history], others might come from a former shtetl and want to know what life was like. Agnieszka Gis, 20, is one of the volunteers. A native of the city’s Kazimierz neighborhood, she grew up surrounded by empty synagogues and the signs of a once lively Jewish community she knew nothing about. Two years ago she went to Israel on a student exchange program, and then started volunteering at the JCC. If non-Jewish Poles are trying to recover their country’s Jewish past, so are Polish Jews identifying with their country’s history. The reclaiming goes both ways. “Polish history is Jewish history, and Jewish history is Polish history” goes the new maxim, one repeated often by those interviewed for this article. Poland has been independent only three times in its long history, including the latest period, which began with independence from Communist rule in 1989. That’s probably why, those interviewed say, Polish Jews today are proud to call themselves “Polish,” exhibiting a national identification one doesn’t find in most other European countries. They identify with their country’s recent struggles, from the anti-Nazi revolts in wartime Warsaw to the Solidarity movement of the 1980s. That pride in Polish heritage is a central motif of Warsaw’s Museum of the History of Polish Jews, which, as the country’s first and largest private-public partnership cultural institution, has received tremendous coverage from the Polish media. “There’s always been the attitude that Poles were inferior,” says Tad Taube, chair of the Belmont-based Taube Philanthropies and one of the three main donors to the museum, as well as a major funder of other Jewish institutions in the country via his foundation’s Jewish Heritage Initiative in Poland. Promotional materials for Warsaw’s new museum claim that 75 to 80 percent of American Jews, and 60 percent of the world’s Jews, could trace their roots to Poland, a statement that many American Jews’ Russian-speaking grandparents might contest. But it all depends on how, and when, you look at it. In the medieval gallery, labeled “Jewish Paradise,” a large map on the wall shows Poland at its greatest, the 80-year period of the Polish-Lithuanian Commonwealth when, from 1569 to 1648, the country’s borders reached deep into modern-day Russia, Lithuania, Ukraine and Belarus, including most of the Jewish population of what would later become the Russian Pale of Settlement. In this scenario, the descendants of most Eastern European Jews are indeed “Polish.” And that’s the vision that works well in today’s Poland, which is still a young country testing the waters of its new democracy. Prugar and his peers are too young to remember the dark days of postwar Poland, both the state-sponsored anti-Zionism and anti-Semitism of its Communist rulers, and the indigenous anti-Jewish pogroms that greeted survivors of the Holocaust when they returned to their prewar homes. Only in the past decade has Poland begun to confront this ugly aspect of its history. The story of Jedwabne, a town where, in 1941, local Poles burned to death more than 300 of their Jewish neighbors while Nazi occupiers looked on, was hardly known before the 2001 publication of Jan Gross’ “Neighbors,” a book now widely available throughout the country. The story of Jedwabne, and others that illustrate the sometimes uneasy relations between Poland and its Jews through the years, are dealt with openly in the museum, a conscious decision by organizers that involved much discussion, some of it quite heated. “A goal has been to avoid apologetics, Jewish or Polish,” explains Brandeis University professor Antony Polonsky, the museum’s chief historian. “Were Jews better off here than elsewhere? Yes and no. That, some Polish Jews say, is something that Jews from other lands seem unwilling to do. The March of the Living, an annual event that brings thousands of young diaspora Jews to Auschwitz and then on to Israel, is a sore point among many Polish Jews. Why, they ask, does the delegation only visit a death camp, as if that describes Polish Jewry? Why do the visitors not see the revival of Jewish life in the country? In response, the Krakow JCC has organized Ride for the Living, a 50-mile fundraising bicycle ride from Auschwitz to the JCC that aims “to not only remember Jewish history, but to celebrate and support the miraculous rebirth of Jewish life in Poland today.” A second annual ride is set for June 4-7, 2015. The rebirth of Jewish life in Poland officially dates back to 1989 and the country’s first free elections. But the initial steps were tentative and piecemeal, well through the 1990s. This past decade, however, has seen the emergence of a number of major Jewish communal institutions, including the Krakow JCC, which opened in 2008, and the Warsaw JCC, which just celebrated its one-year anniversary. Taglit-Birthright is active, as are Jewish youth organizations and Jewish publications, plus Orthodox, Reform and nonaffiliated congregations in the major cities, as well as museums and Jewish archives. All of this has helped create a strong Polish diaspora identity; like American Jews — but unlike many European Jews — Polish Jews today make no apologies for wanting to stay in Poland, which they feel is their country. Gawron postulates that this is largely because those with the strongest Zionist identities immigrated to Israel 10 to 15 years ago. “Many of them still feel connected to Poland and often come back,” the professor says. On the other hand, she and other young Jewish activists say the revival continues, with more and more Poles continuing to discover their unknown Jewish roots, but it’s also taking on a different form as active Jewish life moves into the second generation. Both he and Dorosz say the opening of the Warsaw museum is of major importance. “The museum makes me proud to be Jewish, and to be Jewish in Poland,” Dorosz adds. Jonathan Ornstein, an American ex-pat who has lived in Poland for 13 years, has been the director of the Krakow JCC since it opened. He notes that on a typical Friday night, Shabbat services are held at the JCC, as well as across the street in an Orthodox synagogue and, often, next door at the Temple Synagogue, the city’s historically Reform synagogue that is now used mainly by visiting Jewish groups. Groups amble between the three buildings, and the singing can be heard from the street. With public displays of anti-Semitism more and more common throughout Europe, Poland is, he says, a great place to be Jewish. “This is the only place in Europe where it’s easier and safer and better every day to be Jewish, and all of this is happening an hour’s drive from Auschwitz,” he says. On a recent Friday night, more than 200 locals and visitors shared Shabbat dinner at the Krakow JCC. Volunteers served up roast chicken and Israeli salads, edging between long tables filled with families, young singles and the elderly, most of them Holocaust survivors. One of them was 80-year-old Zofia Radzikowska, who survived the war with her mother using false Aryan papers. “We had the ‘look,’ and we spoke good Polish,” she says. Her father was killed in Auschwitz. After the war, she learned Hebrew and applied to leave for Israel, but was denied a passport. She went on to a long career as a law professor at Jagiellonian University, and in 1991, she began studying Judaism in earnest. Now observant, she is a regular at the JCC, learning Hebrew, attending Shabbat and holiday dinners, and offering regular drashes, or commentaries on the weekly Torah portion. Like her younger compatriots, Radzikowska identifies fully with her country. She served on Krakow’s city council for eight years, from 1994 to 2002. “We are Polish,” she says. “I have a double identity. I am Jewish in my origins and my beliefs. I feel proud of our 3,000 years. But I am born here, with Polish culture, Polish history. Everything here is mine.